Steak Pad Thai Salad. 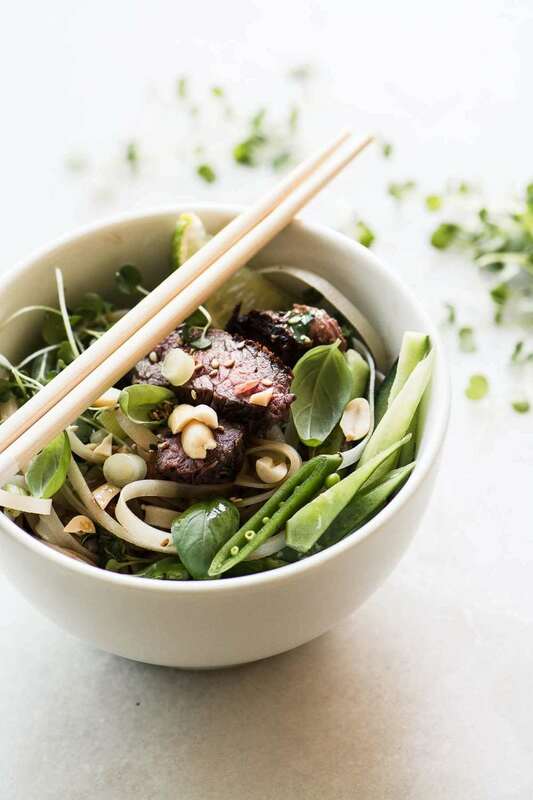 A classic gluten free rice noodle bowl made into a salad with crunchy veggies, healthy greens, and thinly sliced grilled steak. Soak the noodles according to the package instructions, you want them to be nice and soft. Drain well and put in a large salad bowl. Whisk the dressing ingredients together and toss the noodles with some of the dressing. Meanwhile heat a grill pan over medium high heat until quite hot. Season both sides of the steak with salt and pepper and grill for about 5 minutes per side, or until done to medium (or however you like it.) Set aside to rest under foil for 10 minutes before thinly slicing against the grain. Add the vegetables, herbs, and peanuts to the salad bowl and toss to combine. Top with the sliced steak. Pour the remaining dressing over all, and serve, garnished with extra chopped peanuts and fresh herbs.